What We Do And Why We Do It - Learn More About Rapid Prototyping, Casting And Machining Parts | Protocast Inc. While the process of creating prototypes is often a complicated and complex one, the concept behind the work we do here at Protocast Inc. is actually fairly simple. While we’re a full-service machine shop here in the Denver area, we specialize in rapid prototyping services that offer a number of benefits for many different types of businesses. To help give your company a competitive edge when you’re transitioning from product design to manufacturing, rapid prototyping helps you save time and money. The main benefit of prototyping lies in something called design verification, which provides the opportunity to identify any potential design flaws before a product goes into full-scale production. This is incredibly important because the further along the developmental cycle these errors are discovered, the greater the cost is to fix them. Certain die cast components can be especially costly, with tooling prices often running into six figures. By accurately creating an exact prototype of your die-cast design, you’ll be able to discover any errors before multiple products are created. Again, the cost of discovering any design errors after the die cast tooling process is complete can be financially devastating for a business. Tool rework is an obvious cost, but additional costs can include shorter tool life and late delivery of a company’s product to the marketplace. A delay in introducing a product to the market can result in a loss of sales and even a loss of gross market share that can be difficult to recover from. So, appropriate use of today’s prototyping technologies can help manufacturers avoid these needless additional costs and stressful financial situations. There are many methods to prototyping die-cast parts, but without going into extreme detail, there are two primary methods that are considered the most effective in the industry: rubber plaster mold casting, or ‘RPM’, and rapid die casting. Plaster mold provides initial prototype aluminum or zinc castings in a few weeks, and this low-cost ‘soft’ tooling approach of tooling usually costs about 10 percent of the total production die cost. This process is advantageous because it allows for quick and easy modifications to part geometry or the shape of the design. If necessary, plaster mold casting is capable of manufacturing thousands of parts through the use of reusable silicon rubber foundry tooling. Rapid die casting takes a little bit longer, providing initial sample parts in five to eight weeks depending on the part geometry. With rapid die casting, prototypes are processed as a pressure die casting as opposed to a gravity-poured casting. Alloys, including physical and thermal properties, will be the same in prototyping as they’ll be in the production run, whereas rubber plaster mold casting uses slightly different alloys with different properties. Rapid die casting is the best method for providing short runs (up to several thousand) to enable production while final production dies are finished and qualified. RPM and rapid die casting can be complementary in many cases – RPM can provide initial samples in a shortened time frame while the part design is finalized and perfected. Cast dies can offer significant cost savings and increased production rates before full production tooling is completed. At Protocast Inc., what you’ll notice is that we offer multiple types of alloys that we work and cast with. These alloys include aluminum, magnesium, zinc and stainless steel, and each type of alloy includes different grades of metal that are suited for specific prototyping jobs. Aluminum is a popular choice for metal casting, tooling, and manufacturing in general, as many components in the automobile, aerospace, defense and construction industries utilize aluminum for its durable yet cost-effective qualities. Even furniture can be created with cast aluminum! You may or may not be familiar with cast aluminum, but if you are, do you know what this type of metal alloy is produced from? In short, the raw metal material goes through the casting process, which adds more durability and strength to it. Casting also makes the metal material easier and more efficient for use in products. As we mentioned above, typical casting processes for aluminum casts include things like sand casting, die casting and mold casting. In the manufacturing, machining and prototyping industries, die casting is generally the most popular method. As we’ve made clear, cast aluminum is used in an incredible number of different objects and applications, and we didn’t even mention cookware or boat parts. To reiterate, casting aluminum makes the raw metal extremely strong and durable. Though cast aluminum is not quite as strong as cast iron, it is very close in its strength and be more cost-effective for a large production run. Indeed, cast aluminum can be purchased at a cost of roughly half of what you might spend on other types of metals. The lightweight properties of aluminum are also notable, making it relatively easy to work with in a manufacturing environment. Aluminum castings made here in North America are highly recyclable. Indeed, over 95 percent of aluminum castings made in our home continent are made out of post-consumer recycled aluminum. As it turns out, there is very little functional difference between primary (extracted or pure) and secondary (recycled) aluminum in the context of die casting. The cost of extracting pure aluminum for casting processes is extremely high, so it makes sense that most aluminum sources are recycled. Secondary aluminum alloys are derived from mixing and melting pure aluminum with other materials such as magnesium, iron, and copper. Additionally, secondary aluminum is more economical to produce as compared to primary (pure) aluminum because it only requires about 5 percent as much energy to produce. Most of the energy consumption in aluminum die casting is used to heat and reheat the metal during fabrication, and for this reason, metal casting companies like Protocast are able to save more time, energy and money by re-melting aluminum alloys in-house. While Protocast Inc. specializes in casting and machining with aluminum alloys, our Denver machine shop also works with magnesium casting technology for structural applications. Magnesium castings have experienced great strides in development since 1921 when the Dow company began producing magnesium pistons. Magnesium casting technology was well developed during and after World War II and included both gravity sand casting and permanent mold casting in addition to high-pressure die casting. The primary applications for casting with magnesium revolved around the aerospace, defense and automotive industries, similar to that of aluminum. The alloy ‘AZ91D’ is the most widely used magnesium die-cast alloy and has an excellent combination of mechanical properties, corrosion resistance, and overall castability. In the last 20 years or so, most of the development around magnesium casts have been focused on thin-wall die casting applications in the automotive industry. By taking advantage of the superior castability of magnesium over other metal alloys, companies are able to save significant amounts of money and time in their manufacturing operations. Without getting too technical, it’s important to note some of the unique solidification characteristics of magnesium. These include things like excellent fluidity and less susceptibility to hydrogen porosity, and thus, better castability over other cast metals like aluminum and copper. For all magnesium-based components brought to market, casting is the dominant manufacturing process – in fact, about 98 percent of all magnesium structural applications are done through one casting process or another. High-pressure die casting is typically the most common processes used for casting magnesium alloys, and several variants of this process have been and are being developed to improve casting properties. For high-performance aerospace and defense components, gravity sand and permanent mold processes are used. 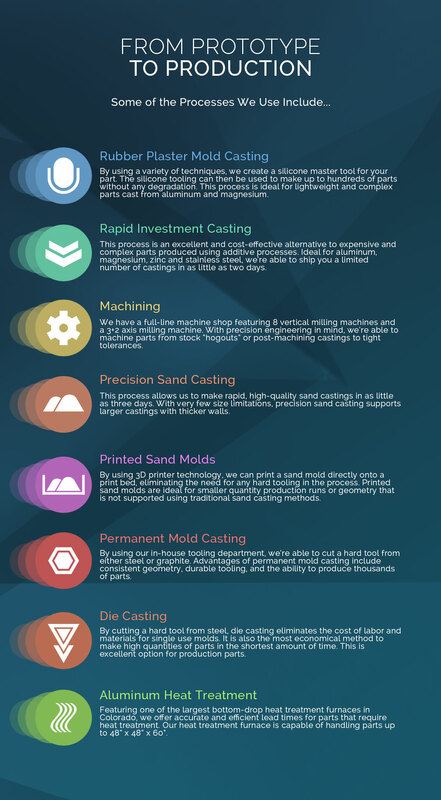 Emerging processes that have been developed and refined in recent years include things like low-pressure casting, squeeze casting, semi-solid casting, lost foam casting and ablation casting. Our planet and modern society at large is constantly facing the need for lightweight, energy-efficient and environmentally-friendly engineering systems and solutions. This need for improved engineering methods is driving the development of a wide range of structural and functional materials for energy generation, energy storage, propulsion, and transportation. While inherently challenging, magnesium, the earth’s eighth most common element found in the crust, offers promise as a versatile casting metal. Such as the case with aluminum, the ease of recycling as compared to conventional polymers makes magnesium alloys environmentally attractive. As the machining and casting industry nears 100 years of technological and systemic development, magnesium casting processes are set to help meet the increasing demands for lightweight structural systems, particularly in the automotive industry. Finally, we come to the other metal alloys that we work with – zinc and stainless steel. Zinc’s high strength and hardness lends itself to many solutions, ideal for machined, pressed, stamped and fabricated components. Stainless steel castings also host a wide scope of applications due to its excellent corrosion resistance and high-temperature properties. Stainless alloys have the ability to be produced in relatively small batches in both quantity and total mass, as well as make complex shapes on a reproducible basis. The typical stainless steel grades that we work with are SS304, SS316, and 17-4PH. For stainless castings to perform at optimum levels, it is vital that full and detailed information is given to the foundry in question, such as our Denver-based company here at Protocast Inc. Similar to that of aluminum and even magnesium, complex net-shaped zinc housings make for precise, thin walls that offer excellent electrical performance and shielding properties. As such, this makes zinc as a great choice for a broad range of consumer electronic devices. Like stainless steel, the castability, wear resistance and structural integrity of zinc make it an ideal alloy for the creation of multi-faceted, highly-complex shapes. These shapes are typically used in automotive safety applications as well as the electronics industry. By specializing in non-ferrous alloys, Protocast Inc. can offer rapid prototype casting to production casting, getting the job done right every single time. In our industry, precision is key and there’s absolutely no margin for error in our work. Many of our employees at our Denver-based machining foundry hold engineering degrees, meaning that our engineering department can help you support projects large and small. From basic feedback on casting and machining intricate parts to reverse engineering, 3D CAD modeling, and finite element analysis, there’s a solution that we can provide for you and your company. As we’ve covered above, there are times when cutting a part from stock is the only economical way to produce it. Therefore, our full-line machine shop is staffed with engineers and operators who are capable of producing the highest quality parts you can possibly obtain for your production. As opposed to a matter of months, Protocast Inc. can cut matchplate tooling in a matter of weeks, saving your production time and money. To make this possible, we have three dedicated CNC machines that execute tool cutting operations. For a part that needs to be updated, is becoming obsolete, or simply doesn’t work the way that it’s supposed to, our part modification services can help. By inspecting and testing everything we do on-site through a variety of tools and machinery, we ensure that your parts, tools and other components are prototyped to your exact specifications, and we won’t accept anything less than what you’re looking for. Where else can you find a comprehensive foundry like Protocast Inc. in the Denver area? As our home, we’re proud to serve you and your company in Colorado and beyond. For precision engineering, trust our prototype casting services. Learn more about Protocast Inc. here!